A fast loading website enhances its performance and user experience. It is also an important factor when it comes to search engine ranking. Last year, Google made it clear to us that website loading time is an important factor in the Google Search Algorithm. So you must take action to check website loading time and performance not only avoid Google Search Engine penalties but also to improve user experience. The tools mentioned below will help check website loading time in an instant. Furthermore, they will tell you what actions you might need to take in order to minimize website loading time and enhance its performance. 1. 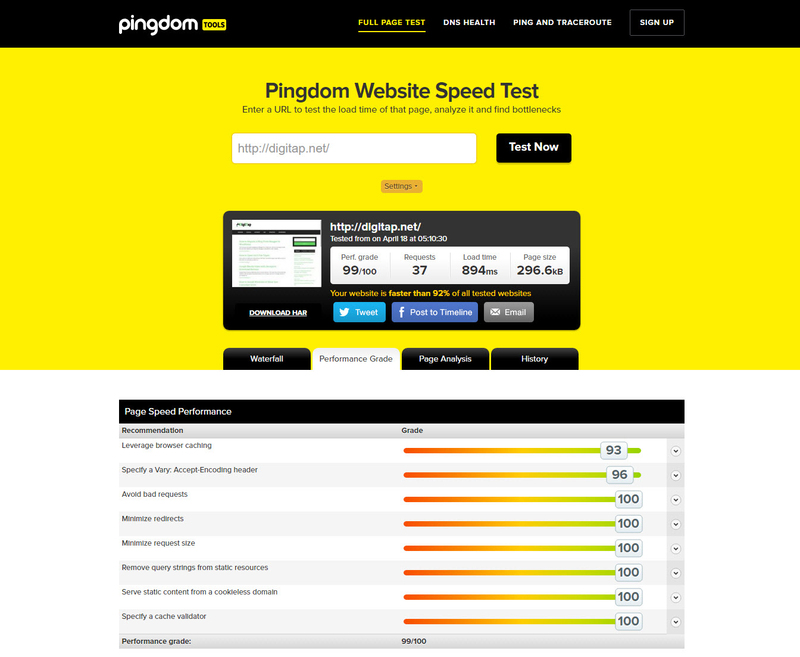 Pingdom Website Speed Test – This is my favorite website speed test tool. And its totally free to use. Simply go to http://tools.pingdom.com/fpt/ and enter website URL. Pingdom Website Speed Test tool not only calculate website loading time, but also analyze it and find bottlenecks. Furthermore, it will show you what actions you can take to make your website faster. Optionally, you can sign up for the Pingdom premium plan in order to check website loading time automatically and to monitor server issues and downtime. 2. Google PageSpeed Insights – Google came up with their own tool to check website speed and performance. Go to https://developers.google.com/speed/pagespeed/insights/ and enter your website URL. It will quickly analyze your website and give it a score. Furthermore, it will give you suggestions on how to improve website loading time. Google PageSpeed Ingihts can be used for both desktop and mobile websites. 3. GTmetrix – Similar to Pindom Website Speed Test tool, GTmetrix calculate website loading time and provides suggestions to optimize it. Go to https://gtmetrix.com/ and enter your website URL. It will quickly calculate your website performance score and page details. At the bottom of the report, it will show you what actions you can take in order to enhance your website loading time and performance. Tools mentioned above will check website loading time. Furthermore, they will show you what steps you can take to improve your overall website performance. What tools do you use? Write down in comments.